In July, when I told her that I had resigned from teaching, her response was unexpected–“Why would you do that? !” I tried to explain, but being in her 90s, my Grammy doesn’t understand blogging and social media and well, computers. She’s never owned a smartphone. Heck, my Dad had to buy her and my grandpa a push button phone because they still had a rotary one. Near the end of our “Happy Birthday” phone call, she asked me if I missed teaching. In all honesty, I can say, “No.” Don’t get me wrong. I loved teaching. I dreamed about being a teacher from a very young age. But after 17 years in the classroom, I had fulfilled my purpose. It was time to move on to the next adventure. And I am so glad that I took the leap…. Well, that my husband encouraged me into taking the leap because I am discovering so much as I blog about our infertility journey. 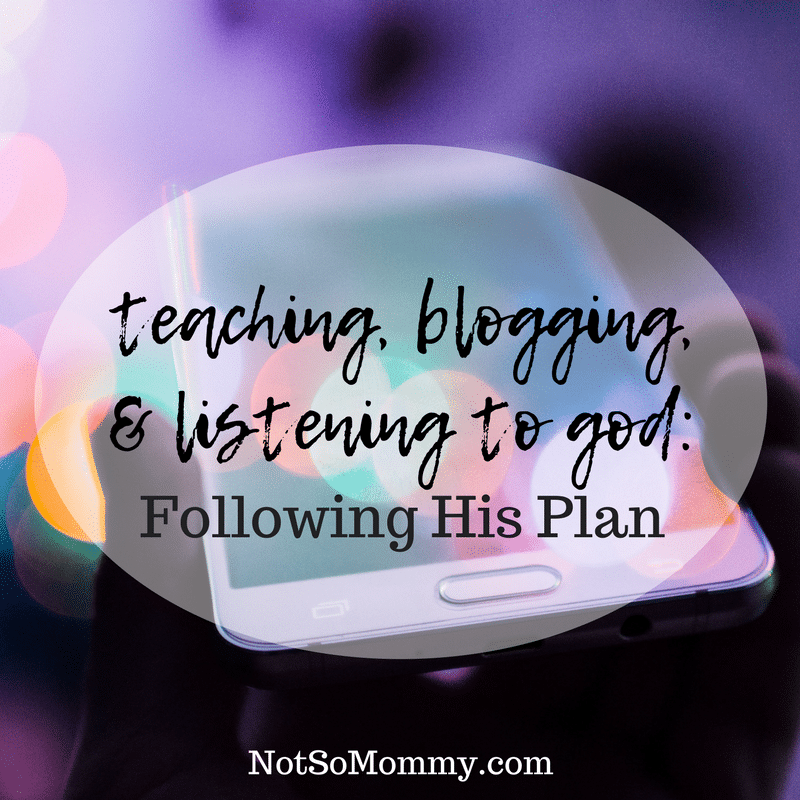 For one, I never considered myself a tech savvy person, but (with the help of my hubby), I’m learning how to manage my website and all that comes with an online adventure. It has caused me to remember that I am smart and capable and can figure things out! Secondly, I have discovered a new purpose. I felt so alone during my infertility struggle, and I knew there had to be other women out there like me. 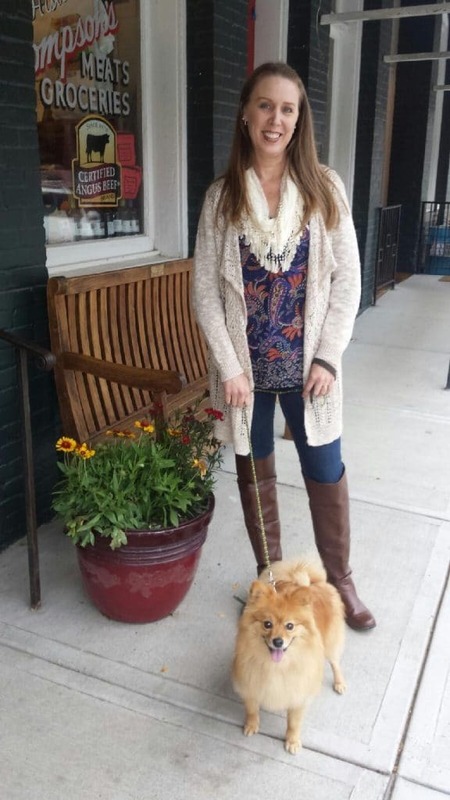 I wanted to reach out—to help others going through the same pain. If I can help just one person, I thought, it will be worth it…. What I didn’t expect was to find a tribe of childless women (and men) trying to navigate this world. 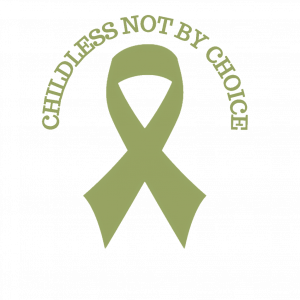 I didn’t expect a simple agreement to take part in a thunderclap for World Childless Week to allow me to connect with so many amazing women and men, bravely sharing their stories of childlessness. And I certainly didn’t expect to feel such fulfillment so early in my new journey. I had considered leaving teaching for about 3 years before I finally took the plunge. It was ridiculously scary to let go of that part of my life—the only part that had turned out like I expected. I was a veteran teacher. I knew exactly what to do in the classroom. I was confident there, and I was good at my job. Really good. If I hadn’t been willing to loosen my grip on that stability, however, I never would have discovered the incredible journey I am on now. And the timing was perfect. 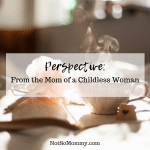 The fact that I started my blog only weeks before the first World Childless Week is not a coincidence to me. As always, God had a hand in putting this all together. But I had to answer His nudging…. But why is pain a part of His plan? While going through a struggle, I know that listening to God is difficult. We wonder why a loving God would allow us to go through pain? So, I realize that my talking of God might make you bristle. Let me explain. I think of it this way…. Are you looking at the wrong side of the rug? We are looking at the bottom of the rug, and it just looks like a mess to us. 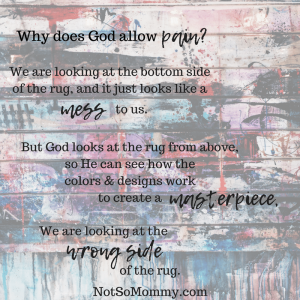 But God looks at the rug from above—from the correct side. So, He can see how all the colors and designs work to create this masterpiece of a rug. So, when I don’t get something (which is often), when I wonder why I have to go through this, when I question what is the point, I remember that I’m looking at the wrong side of the rug. If I wasn’t infertile, we wouldn’t have started special days with our nieces, hosted Bruna or met our Brazilian family, and I certainly wouldn’t have started blogging about being childless…. Heck, I’m not even sure I would have known what “childless” was. So, while I wanted to scream during the struggle and smack those who told me to “have faith,” I’m glad that I held on and kept listening to God. I’m starting to see the “why” in all of this. And the pattern of my life is pretty darned amazing. I pray that you see your beautiful rug, too. Your comment about the tapestry hit home for me. The verses in the bible about barre women being blessed, more are their children etc can be difficult to understand from an earthly perspective. It struck me we may be the gold threads that run throurgh the tapestries that bring them to life. They are small and fine and nearly invisible on their own but when seen from the front àre the highlights that enrich all the other colours bringing the tapestry to life. Blessed to be used by the master to complete the tapestry. I have never heard it explained that way, and I love that! I’m always afraid to answer that question as well, when people ask “why would God do that?” I think of Job in the bible, and I think about Genesis, and how sin is in the world. But the bigger picture is that we have Christ who gave His life for us, even when we were sinners. There are going to trials, and heartache. But when we have Jesus in our lives, for me, it is a little less painful, still painful, but I know the One who is really in control.